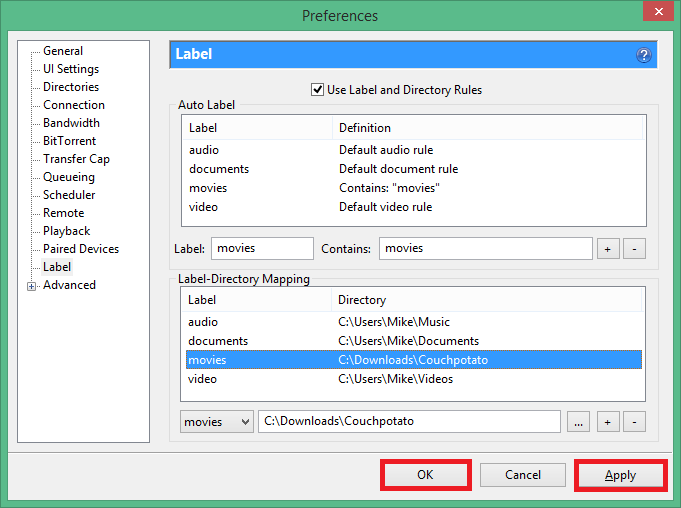 CouchPotato is your automatic feature length video downloader from usenet or torrents. 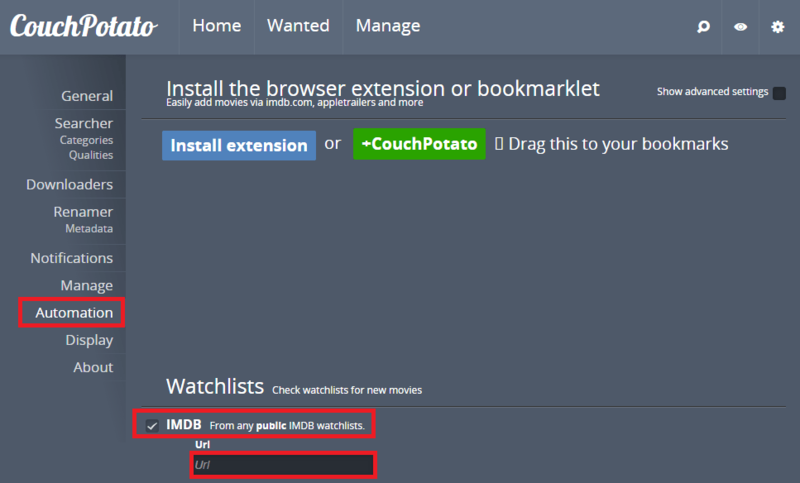 You add content you want to see to a watchlist and CouchPotato will automatically search for them and download them through your usenet downloader or torrent client. 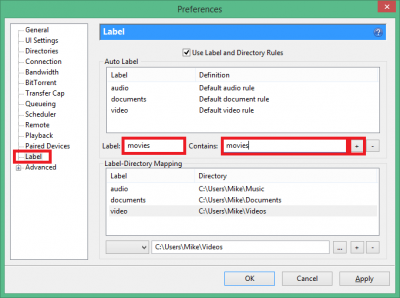 It will even rename and sort the videos for you so your archive is nicely organized for importing into Plex or XBMC. 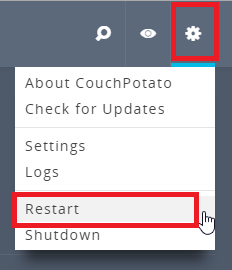 This guide assumes you have already installed CouchPotato on your operating system (Windows, Mac OSX, Ubuntu, Raspberry Pi). 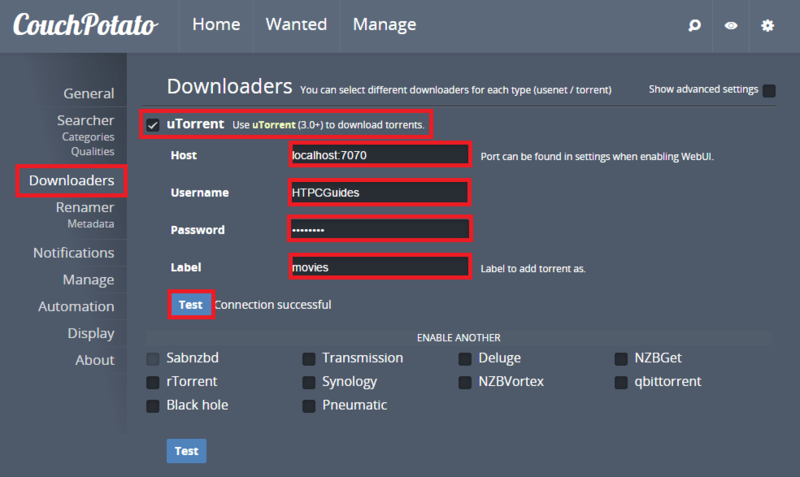 The torrent clients I show you how to set up with CouchPotato are uTorrent and Transmission, rtorrent, Deluge and many others are supported and the same logic applies. 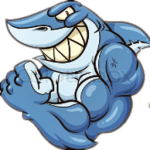 For a better experience I recommend using a combination of usenet and torrents with CouchPotato. 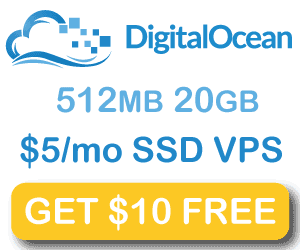 The benefits of usenet are outlined here: Comparing Usenet and Torrents – Which is Better? 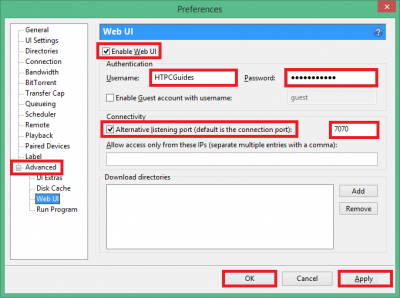 If you are stuck on torrents then please use a VPN like Private Internet Access or PureVPN. Click Searcher on the left and choose torrents as First Search. Enable Transmission by checking it. 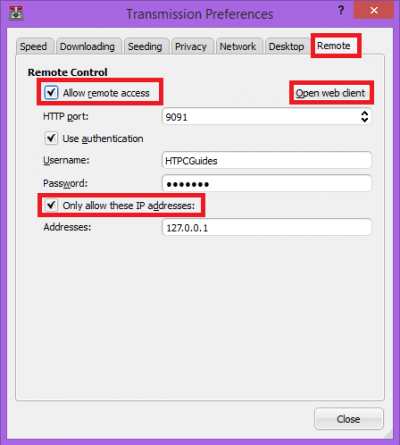 Add your username and password for transmission. In Directory, choose a directory for the downloads to go to, you do not want this to be the final directory the videos will end up in. 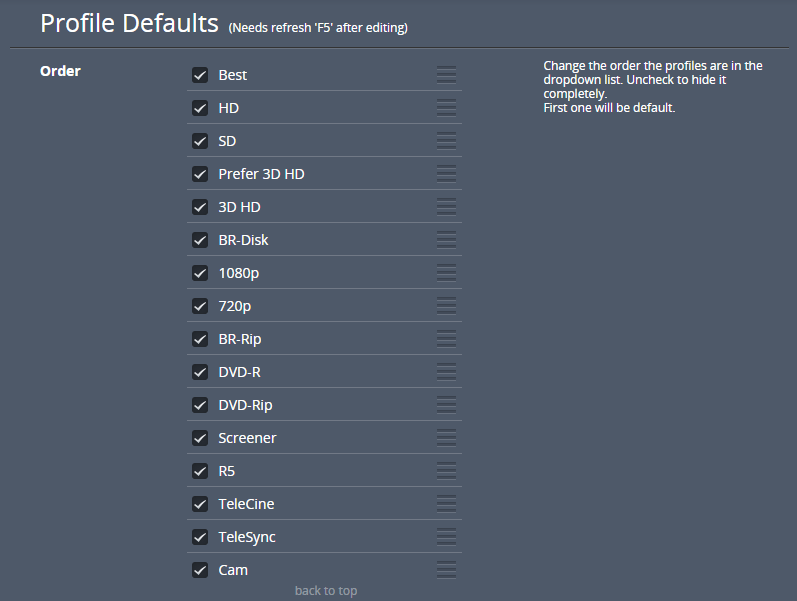 Instead you want it to be a temporary folder that CouchPotato monitors for new videos which it then renames and organizes nicely for you. 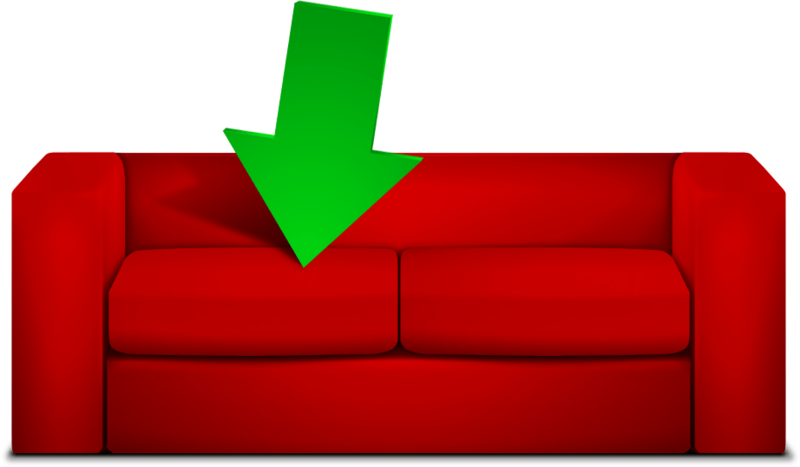 To help understand CouchPotato’s renaming here is a diagram. 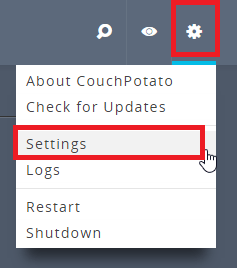 No matter which program you use to download, CouchPotato will monitor that folder as the From folder and move files to your final destination the To folder. It will make sense in a minute. 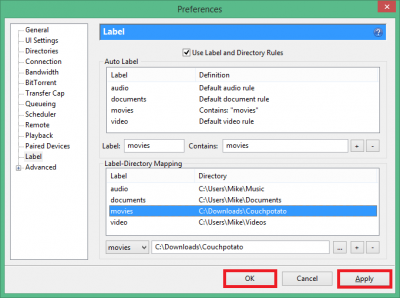 CouchPotato will monitor your From folder for new video downloads and post process them. 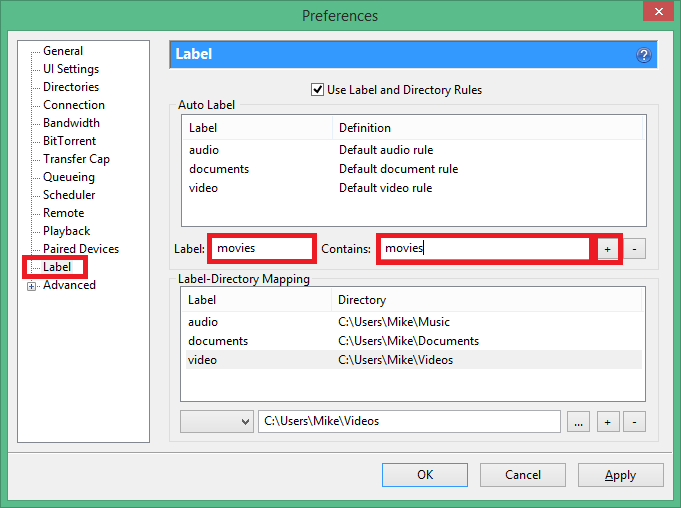 When they are post processed the video file will have its own folder in the To folder. 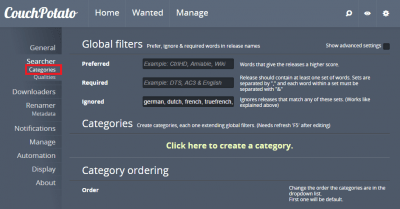 The From and To folder must be different for the Renamer to work. 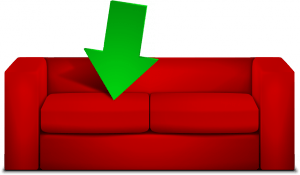 This is the key component of getting CouchPotato to work properly with usenet downloaders and torrent downloaders simultaneously, you will be feeding the downloads into the same folder CouchPotato will be watching. 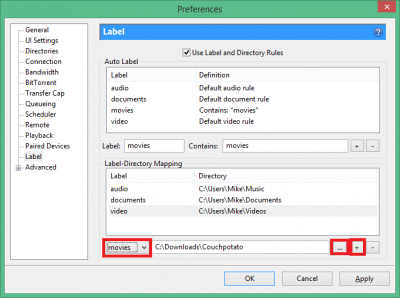 You should also check Unrar in case the release you download is packaged in rar files. By default torrented CouchPotato downloads will be symbolically linked to your To folder. 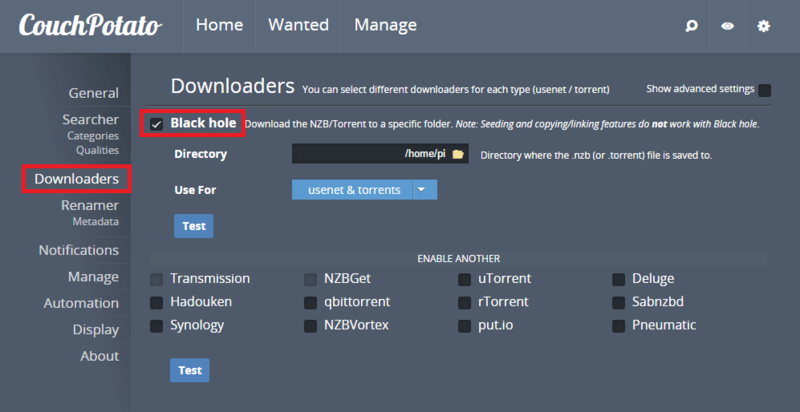 This is so you can still seed the torrent. 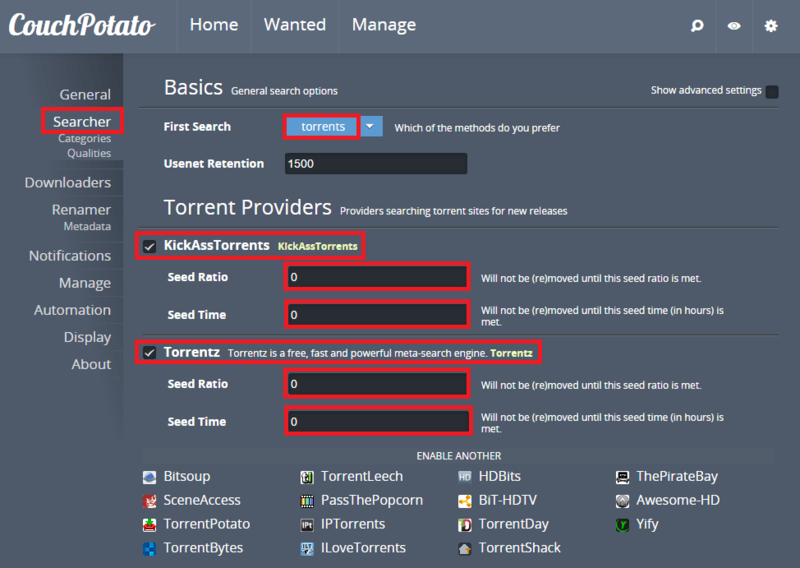 If you are not interested in seeding click Show advanced settings and scroll down until you see Torrent File Action and change it to Move. 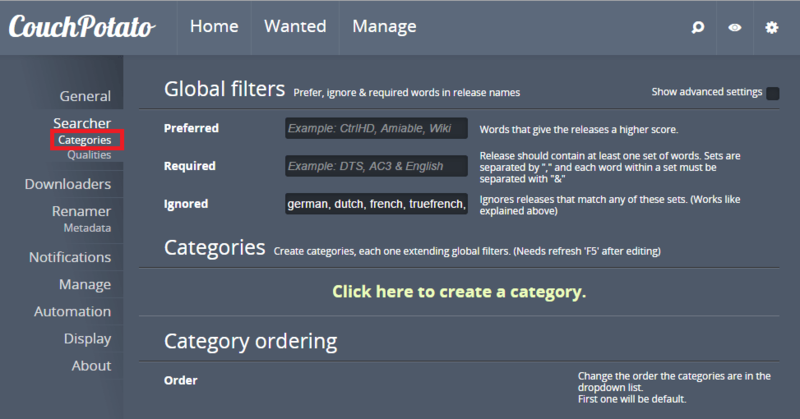 If you are private trackers you probably need to seed so leave it as link if that’s the case. 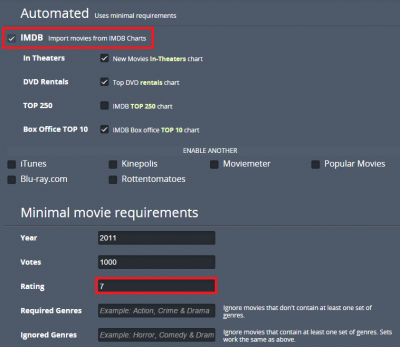 CouchPotato can automatically import your imdb watchlist. 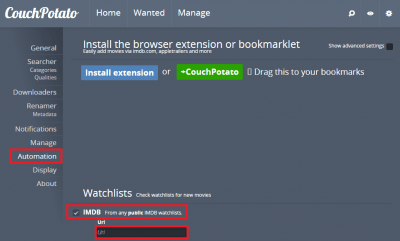 This means you can just add videos you want to see using the IMDB app on your phone or in a browser and CouchPotato will add these items to your wanted list. 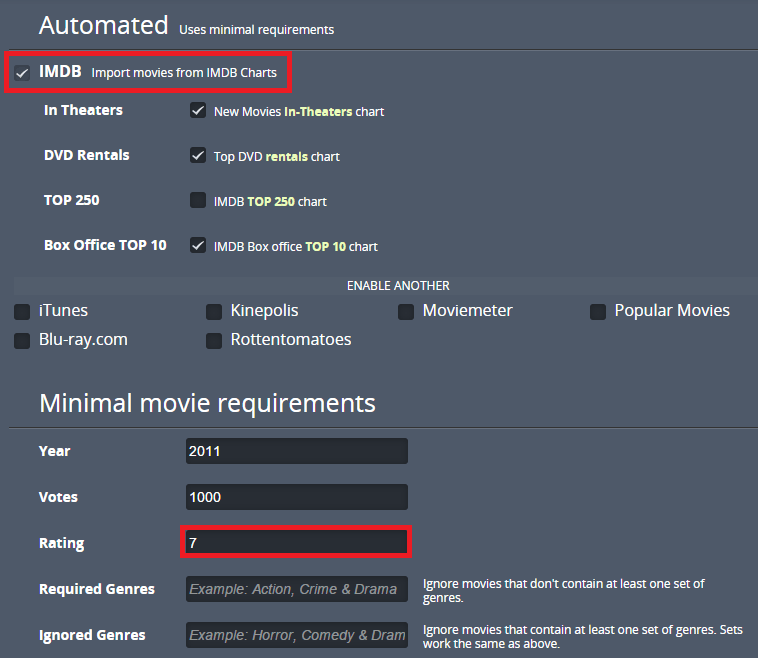 You can have CouchPotato automatically add all new popular videos from IMDB that meet your criteria. 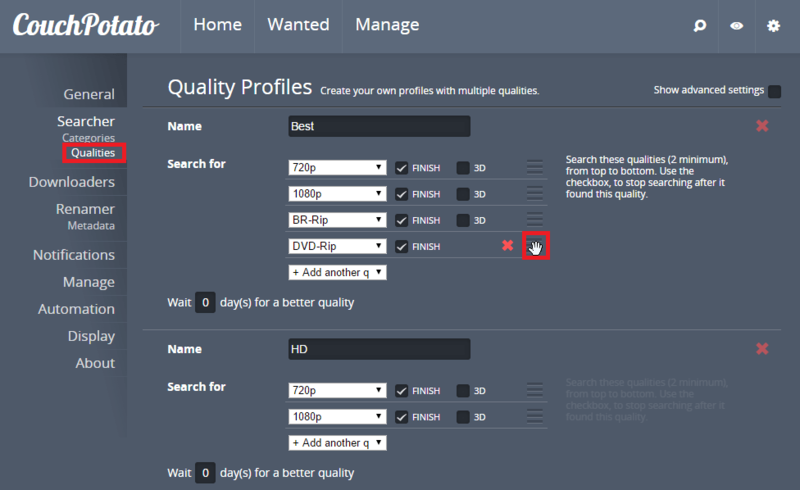 You can adjust the minimum rating, which year the content was released and so on. 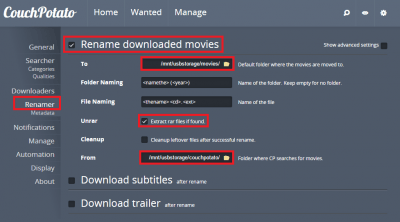 In the bottom right hand corner you will get some messages that CouchPotato is searching for the content on your torrent trackers and then snatching it (downloading the torrent file) and passing it to your torrent client for downloading. 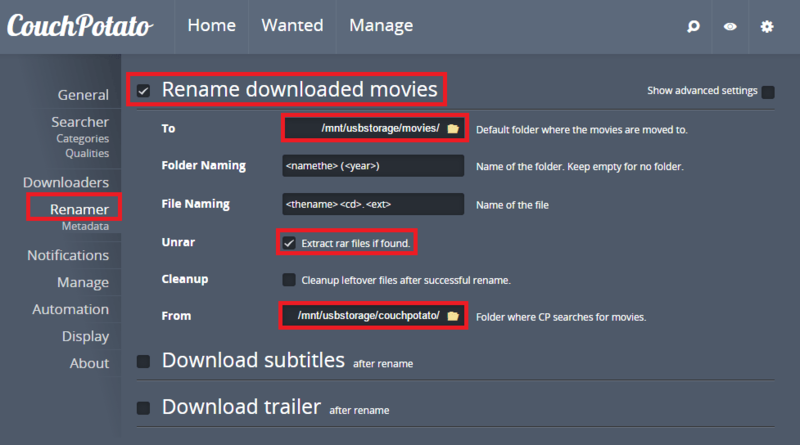 When it’s done it will rename the file nicely and put it in your videos folder. The off green color means the video has been snatched and sent for downloading, once it has been renamed and processed it will turn a nice green color. 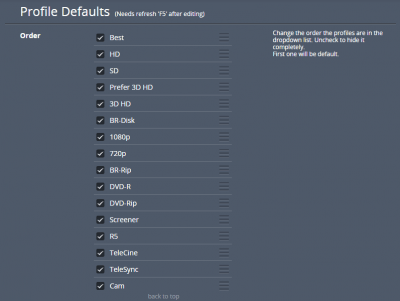 Enjoy your CouchPotato torrent system for automatically downloading videos.